With goals-based wealth management increasingly viewed as the solution of choice, a number of multi- and single-family family offices are finding it difficult to create a process that is simultaneously customized for each client and consistent across all clients (clients here is a term that a number of family offices use to refer to the many family members with whom they must deal). In fact, the challenge is not nearly as complex as it is made out to be—if one understands the need for three distinct phases and several distinct models. The first phase takes place at the level of the whole firm, whether a multi- or single-family family office. The objective is to create a manageable number of standardized portfolio modules, each reflecting a generic client goal. This process starts with the formulation of firm-wide, long-term capital market expectations, which will inform fundamental strategic asset allocation decisions. It is then followed by the definition of a set of likely client goals, or at least goal types, such as maintaining current life style, protecting the value or purchasing power of assets, or increasing capital for the benefit of future generations or philanthropy. The next step involves the determination of the appropriate risk profile and asset class or strategy eligibility for each of these modules. Finally, one creates an optimal strategic asset allocation for each of these modules, which will eventually serve as common building blocks for each individualized strategic asset allocation policy. The next phase is totally client driven. It starts with a discussion of each client’s goals, together with a sensible prioritization. Note that goals can be expressed “generically” with words such as life style or growth, for instance; they can also be expressed as the minimum return acceptable—or required—over some set time horizon within some confidence interval. Equally important, one must then determine the appropriate level of financial assets that should be dedicated to each of these goals to maximize the chances to defease the goal with the desired probability of success. One must then assess whether the family member has sufficient assets to achieve all of its goals. In the event he or she does not, a new iteration is required. If excess assets exist, one must then ask whether the individual would prefer to invest these assets for growth—based on the theory that they will not be missed if they are not needed—or for capital preservation, to ensure peace of mind and lower stress. After this last decision has been made, it is time to combine all the goals-based subportfolios into one in order to formulate an overall family strategic asset allocation. The final phase returns to the level of the whole firm and focuses on managing the portfolios of individual family members in a way that appropriately reflects each client’s unique and specific asset allocation as well the firm’s current view of market opportunities. One starts with the formulation of current views at the firm level by determining strategies that have been deemed attractive, and are thus liable to be overweighted, and those that have been deemed unattractive, and are thus liable to be underweighted. The main challenge faced by many wealth managers—whether family offices or traditional financial advisors—relates to the difficulty of applying these views to a wide range of individual portfolios (a family we know has nearly 400 members and more than 1,000 different accounts or trusts). The challenge has led many managers to create several risk-based model portfolios. 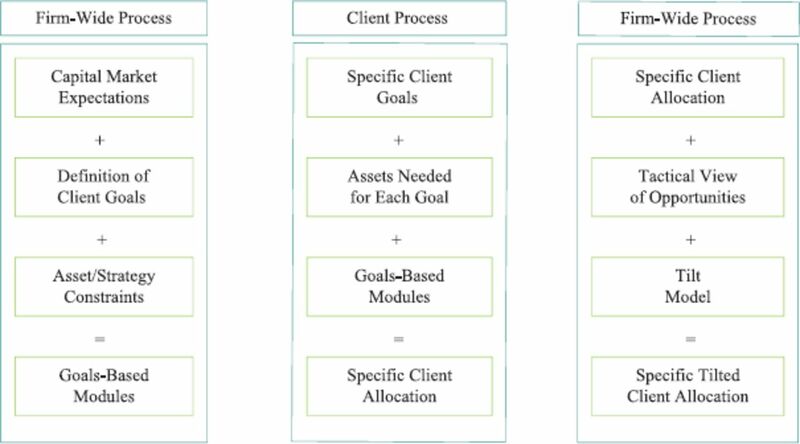 Although this approach may be helpful for the firm, it is suboptimal for clients, who have to accept being pigeonholed according to some predetermined risk profile (from the top down), even though risk tolerance is a bottom-up notion, resulting from combining the risk profile of each goal and the percentage of assets dedicated to defeasing it. In order to deal with this challenge, this final phase involves the creation of a “tilt model” that can systematically translate the firm’s view into individual portfolio allocations consistent with each client’s unique strategic asset allocation. Practically speaking, this feat requires making a few structural decisions, as no model can square the circle. Thus, one must decide whether to privilege asset class decisions (cash, lower half of the volatility spectrum, equity and equity like, and real assets or portfolio hedges) or subasset class or strategy decisions. One also has to decide whether one may be allowed to exceed prespecified deviation ranges for asset classes or strategies in extreme cases, or be forced to remain within them. In the end, the combination of unique strategic asset allocations, current firm-wide views of market opportunities, and a systematic portfolio tilting model can lead to each portfolio being uniquely tilted to reflect opportunities in a way that is totally consistent from one portfolio to another. Exhibit 1 illustrates the architecture of this process. Two main challenges sremain, and the industry would do well to focus on them. The first relates to the formulation of tilting strategies that incorporate tax-efficiency considerations. The main bottleneck relates to the need either to have the process be non-systematic or to develop some global factor risk model. The second relates to the need to be able to report performance at both the total portfolio and individual goal level. This probably requires some form of module and strategy identification and may be complex in practice. Yet it is a crucial element of the overall framework; one of the main rationales for goals-based wealth management is the ability to benefit from the feedback loop associated with the realization that goals are being met with the probability that was initially required. The spring 2013 issue of The Journal of Wealth Management begins with two articles dedicated to broad behavioral finance issues. The first, by Stephen Dym, focuses on the need to recognize “comfort assets” in portfolio optimization. Using gold as an example of such an asset, he shows how an investor can choose an optimal asset allocation (including currency hedging), recognizing gold both as a currency diversifier and a “desired asset” independent of its expected return, risk, and correlation with other assets. The second, by Brian Boscaljon, considers an individual’s critical wealth level. The author suggests that traditional asset allocation models based on modern portfolio theory’s assumptions that individuals are homogenous are not appropriate, in part because they fail to recognize that individuals may seek their own desired sustainable consumption and amount of leisure time. The next article, by Stephen Horan, Robert Johnson, and Thomas Robinson, stands on its own. It confronts the conventional wisdom that suggests that taxation is a jurisdictionally specific discipline by arguing that tax-efficient asset management is a global rather than local discipline. The authors maintain that, at its most basic level, tax on investment and capital is imposed by governments in a finite number of ways. Rather than becoming experts in local tax codes, wealth managers should therefore understand the economic principles of taxation that apply globally to avoid making decisions that may be tax wise but pound foolish. The next four articles deal with a variety of asset allocation issues. The first, by Alexander Conconi, Monica Demidow, Peter Klein, and Jijun Niu, considers the impact of an equal-weighted sector ETF on total portfolio performance relative to a market-capitalization-weighted index such as the S&P 500. The authors conclude that results obtained by other authors using shorter time periods remain valid when dealing with the longer 1989–2011 period. The next article, by James Chong and Michael Phillips, revisits the issue of optimal portfolio size by comparing 18 statistics across portfolios. Average portfolio sizes to reproduce the population characteristics were computed, leading the authors to conclude that optimal portfolio size depends greatly on the criterion being used to judge the adequacy of diversification. The article by Donald Smith focuses on the need for users of “black box” technologies to be able to confirm the numbers that are presented to them by data suppliers and to check those calculations and underlying assumptions on a regular basis. He uses bond comparisons to make his point. The final article in this group, by Nuria Bajo Davó, Carmen Mendoza Resco, and Manuel Monjas Barroso, considers whether the inclusion of life settlement funds in the formation of diversified portfolios contributes significantly to the mitigation of market risk and enhances portfolio performance. They conclude that these funds provide the largest diversification and risk-reduction benefit in combination with fixed income, equity, and commodities funds. As usual, our last three articles cover a wide range of unrelated topics, although each is individually most interesting. The first, by Manu Sharma, Rajnish Aggarwal, and Esha Prashar, investigates the performance of Biotechnology ETFs relative to the S&P 500 and NASDAQ Biotechnology indexes during the past five years. The authors conclude that the ETFs were highly correlated with each other and the NASDAQ Biotechnology Index but were least correlated with the market. The next article, by Nils Tuchschmid and Erik Wallerstein, examines the undertakings for collective investment in transferable securities directives (UCITS) “hedge funds,” also called newcits or alternative UCITS, which are European Union (EU)-regulated investment vehicles. The authors conclude that alternative UCITS seem to have become thus far the most popular vehicle to bring hedge funds onshore. Our final article is by Olivier Mesly and builds on his previous articles. He focuses on the link between financial predation and satisfaction and shows that unconditional trust can be built through consistently satisfying stakeholders, who, in the process, lower their guard and become easy prey for malevolent financial predators.